In our increasingly complex world, real change is notoriously difficult, frustrating, and resource intensive. With planetary challenges mounting, we need more generative organisational methods and tools. The premise of PatternDynamics™ is that the design patterns of nature embody the wisdom for cultural and organisational transformation. Accessing this wisdom starts with learning to “see” the patterns of deep simplicity on the other side of complexity. PatternDynamics™, the basis of this capacity, introduces a new method of communication–a universal pattern language that describes the world more holistically, builds more generative relationships, and taps the collective intelligence of any group. It is the first form of communication designed specifically for purpose-driven, collaborative systems thinking. The ultimate benefit is the opportunity to facilitate systemic change. When you learn to communicate purposefully about organisational patterns, and to use this as a way of accessing the collective intelligence for making wiser decisions, facilitating deep, whole-systems transformation becomes a possibility–at any level of complexity. A key to complexity is systems thinking. A key to systems thinking is patterns. A key to patterns is using them as a language to communicate the principles of generative change. The preeminent distinction of PatternDynamics™ is that it harnesses the synergy from uniting three of the most potent strategies for creating better futures: deep purpose, systems literacy, and collaborative thinking. Wellbeing: simplifies your life by bringing clarity to your deeper purpose and your most generative personal strategies. Relationality: deepens organisational, community, friendship, and family relationships through a more holistic form of communication. Change-Making: catalyses social and organisational transformation by working at the systems level. A key feature of PatternDynamics™ is that you can embed it in your work and your life seamlessly. It does not necessarily have to be presented as a program. When you practice communicating this way people will start to comment on your unique ability to see “the way things work” and to coordinate diverse perspectives. PatternDynamics™ leverages new insights from the learning and systems sciences. Learning it is a collaborative affair. The process is designed to be rewarding in its own right, and you will join a unique community of passionate and professional change leaders who support each other on the journey. Joining us positions you with an increasingly important competency. Our traditional methods of social and organisational leadership are not capable of managing the complex challenges that confront us today. Persisting with these out dated strategies in the face of mounting complexity is one of the main causes of the multiple systemic crises we currently face. From the erosion of community social capital to the dysfunction in workplace cultures, and from the planetary environmental crisis to the global financial crisis, there is mounting evidence of the need for more generative forms of organisational life. Currently we are faced with a choice: in our increasingly interconnected world we either accept the mostly out-dated, hierarchical, command and control structures driving the process of Globalisation, in all of its various manifestations–in our workplaces and in our lives; or, we find ways to introduce purpose-driven, highly collaborative, bottom-up, self-organising, transformation that exists when we shift to adopt the principles of a living systems worldview. This shift is the basis for creating something much different–what we refer to as a Planetary Society. The era when we can believe that even gifted individual leaders and powerful, but disconnected, institutions are capable of knowing enough and doing enough to solve our problems, at any level–from the community, to the organisational, to the social–is over. We must equip ourselves to lead change towards a healthier, more interconnected, self-organising world, whatever our current position in life. Continuing to use the out-dated strategies of Globalisation is becoming increasingly oppressive. PatternDynamics™ stands for the simple human dignity requiring the shift to a planetary society. Arguably, we don’t have a choice. With the increasing complexity of our lives, the only viable option is to develop new ways of thinking. The words of Albert Einstein below are so universally quoted precisely because they have never been more true. PatternDynamics™ is a contribution to this new way of thinking–to the emerging social ecologies of mass collaboration now driving transformational change. An essential strategy of this emerging movement is to facilitate collective intelligence. We must learn actual methods and tools that empower everyone to contribute their knowledge, perspectives, wisdom, and talents; and we have to find effective ways to coordinate them. If not, we simply won’t have enough capacity–in our communities, organisations, or institutions–to create the socially flourishing, ecologically thriving world that is possible and that we actually want. When we commit to leading change, life can become very complex indeed. An increasing number of philosophers, theorists and researchers are identifying the importance of what is now being referred to as the Complexity Crisis. In its many and varied manifestations it is, arguably, the pre-eminent challenge of our time. Persisting with inadequate strategies in our increasingly complex world leads to a huge range of unintended consequences. 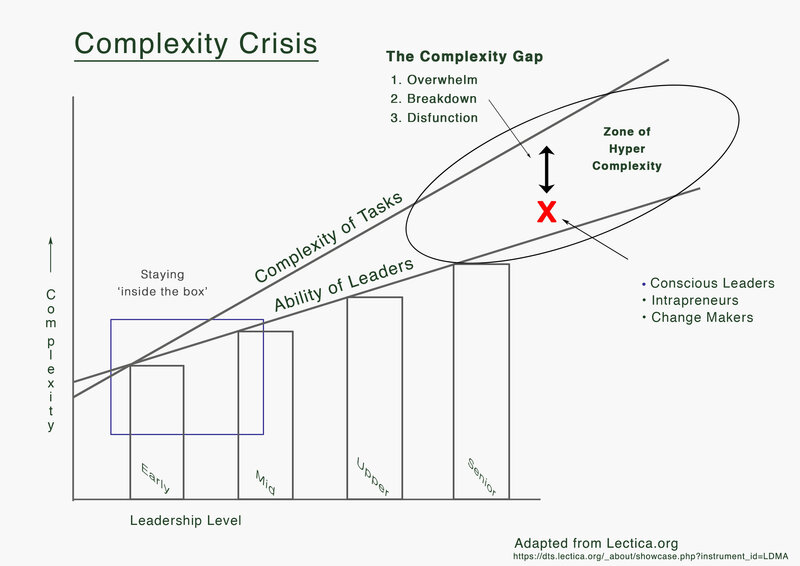 The inability to manage complexity is the actual root-cause of many of our deepest personal, organisational, and social challenges.This crisis has crept up on us somewhat unnoticed, and although we feel its consequences, the increase in complexity itself is not yet widely recognised as the source of our pain. This is something that became clear to me after working as a sustainability advocate, educator, designer, and practitioner for over 20 years. At some point I realized that we had actually developed all the technologies and strategies we needed to create a sustainable world. In fact, I trialled a way of living more sustainably as a community quite successfully by using some of these technologies and strategies. (I relate this story below). Why things were not changing on a larger scale was a puzzle (and a frustration) until I realized that most of our leaders–and in fact most of us–are not well equipped to deal with the complexity of creating effective change in today’s world. After so many years of informing people about the environmental crisis and advocating the use of new technologies and better strategies for sustainable living, it came as a shock to finally see the underlying reason why these approaches were not getting the traction many of us had hoped. Every period in history has a central challenge. Previously that challenge was to make “progress” and to grow the economic resources required to increase levels of material wellbeing. While this challenge is still being met in many parts of the world, the affordances of modern industrial society are lifting people out of poverty at increasing rates. The challenge of our era is to continue to lift everyone out of poverty and to improve human wellbeing while sustaining the ecological and social systems that we depend on–in fact, not just to sustain them, but to help them thrive and flourish. This challenge is of a radically different order than the ones we have faced in the past. It is about a much more abstract problem: transformation in the face of complexity itself. On a personal level, complexity in everyday life is increasing for everyone and just staying afloat for many people has become a major challenge. When we become change leaders this challenge can vastly increase. We step, often unknowingly, into what I’ve come to call the “zone of hyper complexity”. In this space it is very easy to feel like we are, in fact, drowning. Diagram 1 above illustrates this dynamic. The larger the scale of organisation and change management inherent in the role–like being the head of a large organisation, or a government department, for instance–the bigger the gap, on average, between the ability of the leaders and the complexity of their tasks. Many of us choose to step out of these more conventional types of roles to try and make a deeper difference precisely because we do have strong leadership skills, and we have demonstrated a measure of success in conventional life. Even so, the unprecedented nature of many of the organisational and social transformations we seek to create often see us step into complexity gaps that are far bigger than we have encountered before. Personally: We can become overwhelmed with the task demands of our work, and we can get stressed and anxious. Relationships: They may suffer and people in our most important networks can begin to withdraw their support. Change Making: Livelihood and career prospects are often put at risk or diminished or they become more uncertain. Typically, at least early on, making change can be slower, more fraught politically, and more difficult than we had imagined. If this sounds familiar, or if you have seen this pattern before, then it is something we share. This is what happened to me, and in my experience it is very common, but until now, little understood. Learning to be a conscious leader, social entrepreneur, organisational intrapreneur or change-maker requires skills and understandings that are still relatively unusual for people to encounter before they take the plunge. I developed PatternDynamics™ through a long struggle to understand my circumstances and the similar circumstances of many of my fellow travellers. It is a tool born out of the necessity to find a viable way of working for change in an increasingly complex world. I have been a social entrepreneur and organisational intrapreneur for over twenty years, although I had not heard those terms when I started. From before I left school I knew I wanted to live my higher purpose and to make a deeper difference doing it. For a long time trying to keep my head above water took a great deal of my energy. I suffered personally, my important relationships suffered, creating change was far more difficult than I thought, and the certainty, if not always the size, of my livelihood also suffered. There is a parable about an entrepreneur being the one who is riding a tiger; people observing marvel at her ability to ride on a tiger. The entrepreneur, although putting on a brave face, is only thinking about how on earth she managed to wind up on the tiger and how she is going to stay on! What I didn’t realise and what no one told me (I’m not sure anyone actually knew) was that becoming a change maker–and therefor, by default, a special type of leader–would pose a whole series of challenges that neither I, nor anyone I knew, was well equipped to deal with. To borrow a phrase from Harvard researcher Robert Kegan, because of the complexity of the things I had chosen to tackle in my life, I would be, for a large portion of those 20 years, “in over my head”. I have undertaken three major social entrepreneurship ventures, each providing essential foundations for developing PatternDynamics™ and for learning to grow it into a maturing community of practice and a socially committed enterprise. My first venture was as an environmental services contractor, mostly working in sustainable forestry. It started as a small and innovative enterprise and we learned to plant over 200 000 trees a day, something I still look back on with pride. We collected seeds, grew seedlings, planted forests and tended plantations. I loved the work. I was young and full of energy and enthusiasm. Looking back now I realise that, although this was a challenging business and being committed to environmental work did add another layer of complexity, I really wasn’t operating too far outside “the box” in the Diagram 1 above. Like a lot of entrepreneurs I did work very hard, and I did face a lot of stress, but my relationships were mostly about my work, and I managed to exit with more than enough financial resources to move onto my next project. Although I was working in complex territory, it wasn’t hyper complex territory, and I had the energy and drive to come out the other end more or less intact. In a way, this represented my “success” in the more or less conventional world of business, society, and the economy as most of us know it. Looking back, this gave me a false sense of what I could achieve in more complex circumstances. During this time I was also gaining a deep appreciation for and a love of nature from my years of working in the wilderness. It was here that I started to observe and understand how natural ecologies work as dynamic, highly interconnected, systems supremely designed for adaptive change and evolutionary development. I read voraciously in the systems sciences, complexity disciplines, integral theory and anything that I thought could help me understand my new way of seeing the world. I was also practicing and experimenting with an ecological design discipline focused on sustainable agriculture, called permaculture, and a Japanese martial art called Aikido. Both of these disciplines also have deep foundations in understanding the patterns of nature. My next project was more ambitious and moved me deeply and unknowingly into the zone of hyper complexity. In the late 1990s, with the proceeds from the sale of my forestry company, I founded and lead the development of a not-for-profit rural residential sustainability education centre. It was located in the lush volcanic hinterland of the humid subtropics on the east coast of Australia. The centre was called Permaforest Trust, and it went on to be a ten-year experiment in what we referred to as “an educational community for sustainability”. The goal was to learn sustainability skills through practicing them as a living, although temporary, community. Students, staff, guests and volunteers came from all over Australia and around the world, staying from a few days to a few years. Within our accredited programs we learned to grow our own food, create our own power, recycle our wastes, and regenerate the land we lived on. I estimate that by using well-known sustainability technologies and strategies, and by learning to share resources as a community, we each lived on about 1/10th to 1/20th of the resources used by the average Western citizen. We did not lack for anything we needed, and in the end we managed to create quite a special and uniquely functional learning community. Getting to that end, however, was a much more complex challenge, and it had much higher costs, than I ever imagined. It required the development of a whole new way of seeing the world and communicating about it, which eventually became the basis for the development of PatternDynamics™. Managing a contracting company was one thing, but creating a strongly self-reliant, rural community learning and modelling strategies for sustainable living was quite another. I had committed to creating an experimental microcosm of a seemingly preferred way of living and with it all of the complexity of that unformed future. In a less complex world this model of small self-reliant community is a default form of social organisation. Today, in most of the rural developing world people have to live this way to survive, and for much of the last 10,000 years this has been the case for most people. But for us it required radical changes in how we lived our lives. In the past things would have changed slowly, the routine would have been the same year in year out; people’s choices would have been much more limited and therefore the amount and types of variables most people had to consider would be relatively small. Interconnectedness would have been limited to the few people who lived near you, and you could be reasonably certain that the things you did yesterday would mostly be the things you did today. In short, life would have been simpler. At Permaforest Trust we went from the days of mobile phones to the full implementation of the Internet. Most of the people who participated, including me, were relatively young, highly connected, highly mobile, and used to a great variety of events, variables, changes, and stimulation in their lives. We had a comparatively huge range of options in our day-to-day existence and orders of magnitude more resource at our disposal compared to people who lived even a relatively short time before us. Not only did we cope with high levels of uncertainty, we seemed to require it. If none of this had to change when we came to Permaforest Trust, I don’t think we would have been in the zone of hyper complexity–but it definitely did and we definitely were. In a sense, in trying to create a contemporary community system where we could live more sustainably, we needed a hybrid world. We needed a model that included the community living and social commitments of traditional times, the organisational systems suited to a modern economy, and the freedoms of living in the information age. Experimenting with this hybrid was intended to allow us to share the resources and the workload of a self-reliant community, to build our viability as an organisation and as learners, and to take advantage of the emergent opportunities of a highly interconnected world. What we did not factor in was the level of complexity inherent in making the changes–as an organisation, as a community, and as individuals–to actually inhabiting our experiment. Anyone who has tried to facilitate deep organisational change will understand some of the challenges we faced. In the beginning we simply could not handle the work, nor did we have the skills, required to manage the situation. In a very real way we were modelling a radical transformation–in a very short period of time–of a small society. We had to create new forms of governance and community living, new norms and values, new ways of doing business, new forms of production and distribution, new systems of education, new kinds of relationships, as well as create and maintain the physical infrastructure like roads, water systems, agricultural systems, dwellings and other aspects of the built environment. And that was the easy part. The much more difficult part was to encourage everyone to maintain their commitment to the shift to a different way of living. After all, as sustainability advocates we were asking most people to make big changes to their lives, so we should, at the very least, prove that we could do the same. In the beginning the complexity involved in leading this level of change seemed overwhelmingly huge. It was also my transition from a social entrepreneur acting on the world at large to an intrapreneur trying to make change within an organisation. Staff burned out, students were often unhappy, I was exhausted, my relationship with my partner was stressed, and the project was costing more money that it earned. There were many times when I just didn’t feel like I had the strength to carry on and when I nearly gave up on the whole project. I think the thing that stopped me from giving up was that there was one strategy that fascinated me, and which consistently got very good traction where nothing else seemed to work. This strategy was to communicate about what was happening from the systems level. It was fairly natural for us because the basis of all our applied environmental work was the study of ecosystems and how they functioned. It was only a small step to start translating the patterns of organisation we saw in natural systems into the principles for designing our own community. The logic for us in this move was that nature’s designs embodied a kind of natural wisdom that had allowed life to persist, adapt and in fact thrive on this planet in adverse, ever-changing, and complex circumstances for hundreds of millions of years. To this end, I introduced a number of frameworks and models, from the various types of systems theory, complexity theory, and integral theory that I had been studying, into the educational curriculum itself. The more we learned to communicate using the patterns and principles of these frameworks, and the more we learned to connect them to our observations of natural systems, the better things got. For instance, instead of having increasingly heated discussions about the perceived oppressiveness of the management team–or alternatively, management’s perception that other participants were not pulling their weight–we learned to have conversations about our organisational “structure”. We would talk about the fact that all plants, animals, and ecologies–in fact all systems–have structural patterns that support them–things like boundary, network, and hierarchy patterns. Our centre, as a living system, needed structures of a different kind–community structures like agreements and guidelines–but structures based on the very same principles none-the-less. Instead of getting stuck in personal attacks and arguments we learned to coordinate our perspectives by discussing things like whether we needed to shift to a more network oriented structure, or, perhaps, to change the nature of the boundary structures that allowed people to join us. That is, everyone’s point of view was translated into a principle based on a natural pattern. We understood that each principle had implications for maintaining the health of our community. From a systems perspective, what became clear is that everyone was partially right and that we did a lot better when we could work out what each person’s contribution was really about at a deeper level. This allowed us to move the conversation from the blame game to working out which principles seemed to be most prominent in enhancing the health of our organisation and how to work with those principles to make adjustments. In this instance, we redesigned the permeability of our “boundary structure” by communicating better with people, before they joined us, about our community agreements. Or, instead of chronically experiencing tension over the amount charged in course fees, we learned to sense that tension and have a discussion about our patterns of “exchange”. We would reaffirm our overriding purpose for being at the centre and then ask ourselves how our patterns of exchange either supported or did not support that purpose. Then we looked to the exchange patterns in nature as the basis for discussing creative ways of using that principle to make changes. By communicating creatively about the principle of exchange (rather than getting stuck in the complex tangle of details around a particular tension), we came up with a way to introduce exchanges that didn’t necessarily require money. It was a decision that emerged from our collective insight, and it turned out to create a much better outcome for participants and for the centre itself. Discussing issues using our emerging systems language seemed to cut through the complexity in our social environment. It gave us a way of mapping our diverse points of view to a much simpler set of principles. This in turn allowed us to access our collective intelligence by coordinating these principles in service of our deeper purpose. Learning to communicate like this wasn’t exactly magic, but at times it did seem a bit that way. There were instances where, because we had collectively learned to identify a pattern, and to communicate about the principle behind it, we learned to elegantly solve problems that used to be far too complex for us to handle. More importantly, we started to make consistent improvements and to transform into the kind of centre that we had always envisaged. After a while I started to realize that I was thinking and communicating in this new way, either explicitly or implicitly, almost all the time. I would use elements from different systems models and frameworks, along with patterns I identified in nature, to communicate about the principles behind different issues. This was particularly useful for explaining the principles of sustainability. I accumulated a set of these patterns and principles that I seemed to use over and over again. They became prominent features of my sustainability education programs. People would comment on my way of communicating, but I couldn’t really reflect on what I was doing. I just knew that it worked and that it was based on this ability to “see” patterns and to use them as principles that helped to locate the unity across a diversity of perspectives. It took some time to understand the power in this way of communicating and just how the process actually functioned. At the time it wasn’t clear, either, that we had created a very unique situation. In hindsight it makes sense. At the centre we were all deeply embedded in nature and in working with natural systems. A passion for “eco-literacy’” was something that brought us together in the first place. Also, within our organisation and our community all of us were deeply committed to learning how to live more sustainably. Having this combination of a very complex social environment and a purposeful community literate in applying natural patterns created an extremely unlikely, but fortuitous, crucible. We had what I now see as the three magic ingredients for creating highly leveraged change: deep purpose, systems literacy, and a commitment to collaborative thinking. This unusual situation gave us a rare opportunity to discover a whole new way of accessing the wisdom required for real organisational change. In 2007, nearly ten years after founding Permaforest Trust, I sat for a day in the lobby of a hotel near Boulder Colorado after a 5 day Integral Ecology and Sustainability Seminar. Here the PatternDynamics™ framework emerged fully formed in a single inspired session of what I can only really describe as a peak state of “high intuition”. As I sketched in my notebook, all the elements of the various systems disciplines I had been using to explain the patterns of nature and the principles behind them just sort of crystalized into a complete framework of symbols before my very eyes. This kind of insight is less surprising now. I have since discovered that there is evidence for more holistic forms of intelligence to open up when we develop the capacity to experience things from a more systemic orientation. After that I started to wind down the operations of the education centre. In the end, while we managed to create something quite beautiful and unique, ironically, I didn’t think living that way was the most sustainable option. Without deeper change globally, it could really only be practiced by a relatively limited number of privileged people. PatternDynamics™, on the other hand, can be practiced by anyone. We only need the ability to communicate and the desire to make a deeper difference. In any event, my perspective had shifted: we don’t really need more models of sustainable living. What we needed are the tools to make the changes to put in place the models we already have. The effect of my experience at the centre was profound and it brought deeper purpose into what I was doing with my life. I gained a powerful faith in our ability to make real, transformational change and to create the kind of world we wanted. I had experienced this first hand. I knew that helping people learn PatternDynamics™ could make a contribution to wider planetary transformation. So began my third social venture, the process of bootstrapping the development of PatternDynamics™ by using the methods of PatternDynamics™ itself. A growing number of us know that transformational change is possible. It is necessary, and it needs to take place in every part of society. We have examples of many different types of organisations transforming themselves into better global citizens. We have the emergence of social entrepreneurship ventures that have made a profound difference, sometimes to millions of lives. We also have many examples of social intrapreneurship initiatives that have created innovative programs from within larger organisations. What we don’t yet know is how to facilitate these transformations reliably, at the required scale, at the required rate, and most importantly, in the most generative way. This is the complexity challenge writ large. At this stage the most strategic opportunity is not to provide more evidence for change or more reasons why we should change. The key going forward is to develop and disseminate the actual tools and methods that will empower people to facilitate these changes. Not only is this necessary, but it can be rewarding on many levels. I bill more now for a day’s work, helping people learn to lead organisational change, than I used to earn from a week working as a sustainability educator. This is worth mentioning because we can’t make the world a better place unless we are resourced to do it. More than ever, organisations know they must change. Their leaders know that existing methods are not working. This is our opportunity to catalyse transformation throughout the global economy by bringing emergent skills and competencies for change into the organisations that form it. In researching the basis of how PatternDynamics™ works, I’ve come to understand that its effects are based on the power of language. The power of language is that it enacts our world. Until we have a symbol that represents an aspect of reality, that aspect of reality cannot be communicated, and if it cannot be communicated then it will not, in any useful way, exist within that community, nor will it exist as a feature of its world-view, nor can it be a relevant part of the kind of world that community creates. Since the dawn of settled civilisations humanity has had three archetypal stories about how the world works. Each one describes the world in a way that is essential for helping us understand collectively what we need in order to be nourished and what we are required to believe to obtain it. The first story is that what we need in order to be nourished is a secure place within a healthy family and community. This is the story of the agricultural expression of human culture. It has been with us since the development of farming, villages and cities. What is required to have flourishing families and communities is a belief in God, or some unifying belief in a supernatural being or beings. The languages of this story are dominated by references to the binding social power of serving something greater than our selves–usually an aspect of the divine. We can call this story the Story of God and Family. The second story is that what we need in order to be nourished is a secure place within a healthy economy. This is the story of the industrial expression of human culture. It has been with us for only some 400 years, since the beginning of the industrial revolution. What is required to have a flourishing economy is a belief in money and freedom. The languages of this story are dominated by references to money, economic realities, and the freedom required for individuals to engage in the economy as it works best for them. We can call this story the Story of Money and Freedom. Both of those stories served humanity, and in fact still serve humanity, in meeting the challenges of different cultural and social contexts. However, both of these stories developed because the conditions requiring them arose from that which came before. Similarly, the story of our time is arising because new challenges are emerging out of the industrial period that are moving us into the Planetary era. This third story is still emerging, but in its essence it goes something like this: What we need to be nourished is a secure place within a healthy Planetary system–a great evolving and ever adapting living system that must include all communities, all economies, and also all the ecologies on which they are dependent. This story has only really been with us for the last 40 years or so. What is required to have a flourishing Planetary system is a belief in the deep purpose of facilitating generative systemic change. The languages of this story will need to find ways to reference the relationship between deep purpose and the ability to create healthy systems level change. This is the living systems story. We can call this third story the Story of Purpose and Change. This is the power of language. It forms the nature of our stories, and it is the nature of our stories that changes the nature of our world. PatternDynamics™ matters because it is one of the languages that are now emerging to tell the living systems story of Purpose and Change required for making the transition to a Planetary world. The central generative mechanism of PatternDynamics™, as a living systems language, is that it helps coordinate perspectives. And coordinating perspective is the basis for making wiser decisions. Natural Wisdom: The systems literacy required for understanding the design patterns of nature and for translating them into the principles of generative human organisation. Collective Intelligence: The ability to coordinate multiple perspectives by translating their seemingly complex and contradictory details into the simpler principles that illuminate deeper complementarity. Deep Purpose: Locating the Source of what unifies our deeper complementarity into the wiser course of action required for generative change. The fact that PatternDynamics™ forms a systems thinking framework that helps us access the wisdom of natural designs is useful, but this may not be its most important element. In reality many different systems of this type could help you learn a similar set of principles. A more important aspect of PatternDynamics™ is that it provides a reliable and effective method for helping coordinate perspectives. No matter how complex the array of points of view that are brought to bear on an issue, communicating the principles they represent reveals their potential contribution to a far deeper order and coherence. This kind of coordination is necessary for realising the power of collective intelligence. It is the ability of collective intelligence to facilitate wiser decisions that provides the most highly leveraged strategy for working successful with complexity itself. Let me explain: what I couldn’t reflect on when I developed this way of communicating is that the alchemy in this approach is that it transmutes complexity from a challenge into and opportunity. There is a hidden order in complexity and seeing it brings highly leveraged opportunities for change. This is what systems theorists sometimes refer to as non-linear dynamics, where a small change can have wide ranging systemic effects–the so-called butterfly effect. Whether this effect is operating on a large-scale or small, the leverage it provides is the secret to systemic change. But no single one of us can sense enough of any complex system to reliably take advantage of this effect. It is like the parable of the blind men trying to identify an elephant. They can each feel a part of this complex and beautiful animal, like its leg, or an ear, or the tail, but then they go on to argue about whose partial perspective is the correct perspective. If they only had the wisdom to coordinate their perspectives then they would actually be able to “see” the whole elephant. This is the way to start working with the elephant as a living being. That is what we learned to do at Permaforest Trust–we learned to ride the elephant. I believe it is what we are learning to help people in other organisations do when we introduce them to PatternDynamics™. It is Deep Purpose, the last of the three elements, however, that I think is the most significant. “Seeing” the elephant is only the first step: identifying the complementarity of different perspectives is necessary for understanding the whole system, but not sufficient for unified action. That only happens when that complementarity is focused by being directed at a deeper common goal. Unity comes only through aiming at a strong central purpose: something that truly inspires us about where we are heading and what we are committed to doing. Only then do we move from the act of coordinating perspectives to the outcome of unified, and therefore wiser, decisions. Being united in a deeper common purpose, then, is the final requirement for effective change. It is this kind of purpose that provides the essential unifying and more enduring source of perspective coordinating power. In PatternDynamics™ we simply call this power “Source”. It is the original, central, and foundational Pattern of PatternDynamics™ itself, and working to spread the generativity inherent in it forms our own overriding deep purpose. Within the discipline of PatternDynamics™ we maintain that the key to generative organizations is to communicate in a way that maintains and evolves a clear awareness of Source. The strength of this awareness not only determines access to collective intelligence, it determines the level of consciousness of the organisation itself, and therefore the capacity to continuously make wiser decisions for effecting positive, ongoing, and enduring change. The question, then, is why is this so? Why do we think this is “generative”? And, what is it about sharing a deeper common purpose that unifies organisations so strongly? I think this is because the source of the universe itself is based on a foundational generativity: a propensity to generate more and more complex and wonderful systems in the ongoing evolution of life. This is undeniably what the universe does and therefore, from a human perspective, we can interpret this as a universal purpose. If this were not true, then we would not be here. Being, quite literally, children of the universe, it is only natural that we have evolved to seek alignment with this basic generative life force. If we don’t it is literally an existential matter. Our survival and success are deeply dependent on being able to sense, individually and socially, when that generativity is weak and when things need to change to enhance it. In order for any organisation to function well enough to survive it will have to have a purpose. It might be to maximise returns to shareholders, and it might do this by making widgets or providing a service, or even by make the best widgets or providing the best service in the world, but this is not what we mean by the deep purpose associated with Source. Deep purpose is about an organisation’s commitment, first and foremost, whatever else it does, to finding its unique expression for serving the health and evolution–the generativity–of the life process itself. It is unrealistic to think that every organisation is going to adopt this sort of purpose overnight, but it is possible to introduce this idea and for it to be transformational over time. I will argue that going forward the complexity challenge will continue to get bigger and that the requirement for generative change will become more important. A closer alignment with Source to access the power of deep purpose for that level of change will be a necessary requirement for survival. Learning to make wiser decisions is now a competitive advantage. It is also the key to thriving in a complex world. I think groups that do not align themselves purposefully to support life will fade away. If at this time the dominance of greed and self-interest in organisational and social life seem insurmountable then it is worth reflecting on the historic decline in relative power of organisations predicated on slavery, or societies that denied women the right to vote, or, in our own time to powerful interests that try to keep public information secret. The spread of more democratic and more relevant forms of language have historically been unstoppable drivers of social change: from the escape of written language from ancient priestly castes, to the invention of the printing press, and now to computer codes that help release supressed information into the public domain. There is nothing inevitable about a Planetary emergence. We must work to ensure it comes to pass, but it is the kind of work many of us are yearning for. Deep down we all want to make the changes that will allow our work and our world to align with Source. This is what gives our life true meaning. This is the story of PatternDynamics: how learning to use the language of a living systems world-view can connect us in more meaningful ways and how that connection empowers us to create the world we truly want. PatternDynamics™ supports the three critical pillars required for creating a planetary movement–an emergent movement of diverse change makers participating in transformation in unique and powerful ways. Firstly it is part of a bigger story, secondly it can allow you to have faith, and thirdly it has tools and practices–the tool of language and the practice of generative communication. If you resonate with this story and deep inside you have faith in our capacity for collaborative change, then please take up the opportunity in this workbook to join us and start learning PatternDynamics™ as a living systems language that will change your world. Click here for free resources to get started with learning PatternDynamics™. Kegan, R. (1994). In over our heads: The mental demands of modern life. Cambridge, MA: Harvard University Press. Habermas, J. (1975). Legitimation crisis (T. McCarthy, Trans.). Boston: Beacon Press. Garvey Berger, J. (2012) Changing on the job: developing leaders for a complex world. Stanford, CA: Stanford University Press. This entry was tagged Patterndynamics. Bookmark the permalink.